There was a point in time about a year ago where, upon first meeting other Angelenos and exchanging which neighborhoods we lived in, I stopped getting as many wrinkled noses and, “How’s THAT going for you?’s” in response to my living in Hollywood. But I still get them, to my own bemusement. It’s a revealing comment about the inquisitor, divulging more about their assumptions than I care to disprove. When it comes to drinking and the requisite clubbing, there has sprung up plenty of spots to disprove those stereotypes for a few years now (Library Bar, Harvard & Stone, The Spare Room, Sadie – three of which I can walk to, the other I can Metro to). Enter the fourth. Since it’s in my neighborhood, I’d like to believe that I’m familiar with AMMO, the family-style, market-driven restaurant known for its comforting menu items (also now open at the Hammer Museum). But it had been awhile and I’ve learned of a hidden gem of a bartender who has set up camp at this Highland Avenue eatery as of the last 4 months. His talents go beyond the demands of the stereotypical Hollywood drinking and even AMMO’s dinner crowd. Jonny Ericsen comes straight from a libational world where Fernet Branca is turned over like water. 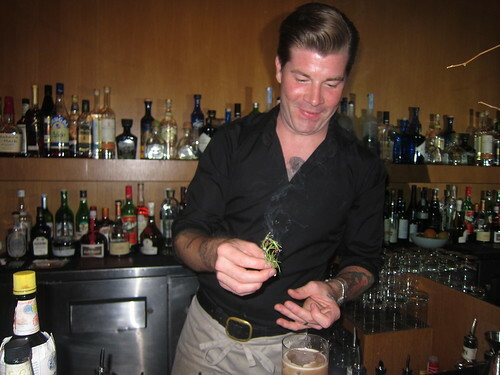 After some time in New Orleans, he bartended at Clyde Common in Portland under Jeffrey Morgenthaler. Subsequent to that, he became bar manager at Little Bird, the sister bistro to Chef Gabe Rucker’s Le Pigeon. Gone from AMMO, now, is the half vodka-based cocktail menu. The resulting end-of-summer menu does Hollywood a solid. Gin and amari lovers will enjoy the Copper Cup. Cucumber-tini (yes I did) lovers will get schooled and yet love the…Cucumber Martini made with gin, market-fresh cucumber juice (squeezed daily), lemon juice and fresh mint. But lest I go on before another heat wave strikes summer is over (he’ll still make you anything on the old menu), I must stress that Jonny is at his best when given free rein to create what you probably knew you wanted, but what you didn’t know was possible. Simply tell him what you like to drink starting with the type of spirit you prefer with the addition of a few directionals. Citrus? Amaro? Spicy? Herbaceous? This is essentially what our cocktail tasting turned out to be: A bar-makase (bartender + omakase) experience where Jonny just ended up making up drinks as he went along, according to what we said we liked to drink and the notes we liked to taste. His expertise lies in very simple drinks – that is, without the plethora of ingredients – while achieving something that tastes very, very good. A big reason is his selection of quality spirits. 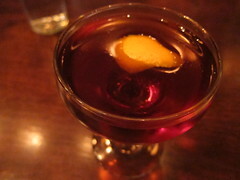 Included in our “bar-makase” session was a Sazerac, clearly hearkening back to his New Orleans days, made with Willett Rye. When we requested a spicy-citrus drink, he shook some Tequila Ocho Reposado with grapefruit juice, half-pickled calabrian chili as well as bits of raw red chili and a cracked pepper garnish for good measure. We also tried an improvised cocktail with Brugal 1888, lime, lavender syrup and basil that was refreshing and light, yet savory. There were a few others played by ear that were all very good. To wit: Whether Jonny is done tooling with his fall cocktail menu or not, if you visit AMMO in Hollywood while he is there (Wednesdays through Saturdays during the week) and you know what you like, you’re bound to end up with one, two or three very good cocktails. It’ll be our secret. 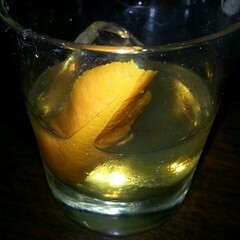 This entry was posted in cocktails, Hollywood and tagged @ammorestaurant, AMMO, Amy Sweeney, bar, bartender, Clyde Common, cocktails, Highland Avenue, Hollywood, Jeffrey Morgenthaler, Jonny Ericsen, Little Bird, mixologist, omakase. Bookmark the permalink.